For Immediate Release: Posted On 4/6/2012 By Industrial Magnetics, Inc.
Industrial Magnetics, Inc. is now offering their RotoDrawer™ Magnetic Separator with MAGnanoSHIELD® coated tubes, an FDA compliant, antimicrobial coating from General Magnaplate that offers 99.9999% microbe resistance to assorted bacteria and fungus strains. 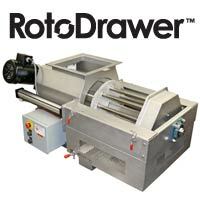 The RotoDrawer™ magnetic separator is designed to rid ferrous metal from powder & bulk processed products that have difficult flow characteristics and a tendency to bridge and choke when using traditional, stationary, tube style magnets. Featuring a motorized, cylindrical configuration of Rare Earth magnetic tubes that continually rotate through a gravity fed product stream, the housing’s unique design keeps the product flow moving while capturing any ferrous metal contamination. Ideal for products that have a higher moisture content or particle size, such as flours, cake mixes or corn starch, the RotoDrawer with MAGnanoSHIELD® treatment not only improves product purity, but also helps improve sanitation and production efficiency. IMI’s Rare Earth RotoDrawer™ is available in either an EZ-Clean or Self-Cleaning design to simplify the removal of collected metal and prevent any metal wash- off back into the product stream. Standard sizes range from 8"x8" to 18"x18" inlets and outlets, with custom designs and sizes available to fit exact application requirements.